The number of social media followers you have can be an important measurement for business growth and success. To help you get more social media followers, check out these tips for using email marketing to build your social media following. Perhaps the easiest – if not the most obvious – way to get more social media followers is to simply ask. Write a short article and sell the benefits of connecting with your business on social media. Your followers will be the first to know about upcoming sales, they can ask direct questions, and they can get quick answers or additional tips. Include a post from your social media website as well as a large icon, button, or link to the site for easy access. Offer an incentive for social media engagement. For example, offer a “pink spoon” by sending out a blast to your email subscribers that might offer a free product for “liking” your business on Facebook or following you on Twitter. Then advertise the incentive on the social network site so that all of your followers will see it. BONUS: Host the incentive on your business’s website and you’ll get more visitors and traffic. MailChimp has Pinterest Integration, allowing you to send your Pinterest boards directly to your email list. That would inspire most Pinterest users to follow your business on the site they are already familiar with, offering your business more opportunities for sharing and exposure. You can create an RSS feed from your Facebook account. Create a RSS to email newsletter from your Facebook feed. This is a great way to accent your regular content and get more likes on your Facebook business page. Every email you send out to customers, clients, vendors, partners, and whomever else should include links to your social media accounts. The links should be placed either in your email signature or at the footer of the page. The links should be very visible and obvious, allowing the user the opportunity to find you online. Your partners and vendors can be a valuable resource when it comes to attracting social media followers. Send a brief and friendly email asking them to add you on your social media platforms. Let them know that you’ve already followed them and will share their information with your audience as an incentive. A “call-to-action” (also referred to as a CTA) is a very valuable tool that encourages the user to do something. This “something” can range from buying a product to sharing a link – it’s entirely up to you. Most businesses know that they need to use CTAs in promotional posts, blogs, and emails, but forget to use them in other places like “welcome” and “thank you” emails. Never pass up an opportunity to ask your customers to do something, such as following you via social media. To build your social media following via email, you’ll need a good sized list. Building an email list will lead to more visibility (on your website, on social media, and through word-of-mouth), which in turn will lead to more customers and increased profit. Make sure your business website has a subscription form on every page. Make the process of signing up for your email list as simple as possible, and never ask a customer for more information than you actually need. Building your social media following through email marketing can be a bit of work. It requires thorough planning and dedication. Set aside some time to develop a plan that works best for your business, and once you implement it, STICK WITH IT! Being consistent and persistent will win the game. By encouraging subscribers to follow you, offering incentives, using CTA’s, and linking your social media accounts to your emails you’ll be well on your way to developing a successful social media strategy. What are some ways you’ve found to get more social media follower via emails? Please share with us in the comments. Amy Hall is an expert on Social Media and Email Marketing. Amy is a nationally recognized MailChimp expert advising large and small businesses on effective Email Marketing Practices. Amy also builds WordPress websites with over 6,500 logged hours, as well as the content manager for MaximizeSocialBusiness.com. Her core business, AmyHall.biz, advises and implements WordPress, Social Media, Inbound Marketing, and MailChimp Email Marketing solutions for companies. Thanks, Amy. It is Bonnie from Social Media Manager School. I am just working on making some modifications to my site, getting it ready now that I am a Social Media Manager School Graduate. In your experience, which email provider is the best? There are so many and some use InfusionSoft while some use ConvertKit or .. How do you make the right choice? Based on what criteria? I am currently with MailChimp because it is free up to certain number of subscribers. A lot of this depends on what you want to do with your email and what you want your email to do for you? I use and recommend MailChimp for 80% of businesses out there. It’s free for up to 2000 email addresses and 12000 email sends a month. They’re easy to use and have tons of integrations available. And for most drip campaigns they work beautifully! If you are going to do some advanced segmentation and want to move people between groups/lists then I think ConvertKit is the winner over InfusionSoft. ConvertKit has a reasonable price point and manipulates email as well as InfusionSoft. But like most email service providers, they are not a CRM. I use Agile CRM hooked up to my MailChimp for my total client contact system. Hi Steve! This is a great graphic! Although I’m not sure I agree with some of the points. 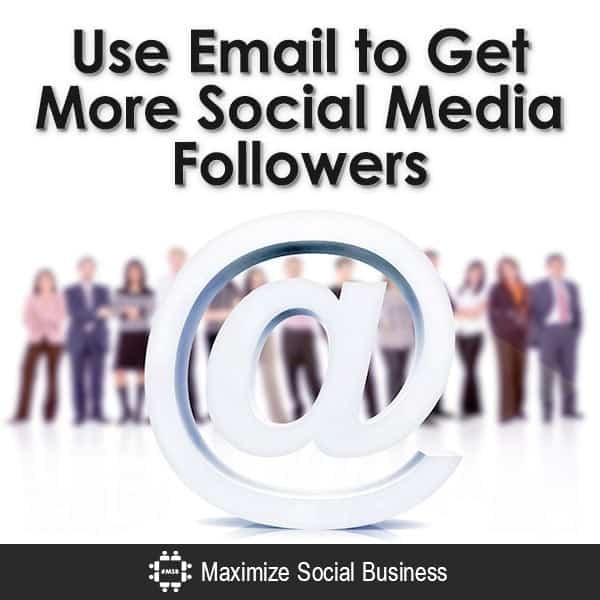 Social media followers are not necessarily potential email subscribers. Some people don’t want their inboxes cluttered so they will opt into social media or put your blog on an RSS reader like Feedly. That doesn’t mean that they’re not potential leads or that their networks aren’t potential leads.